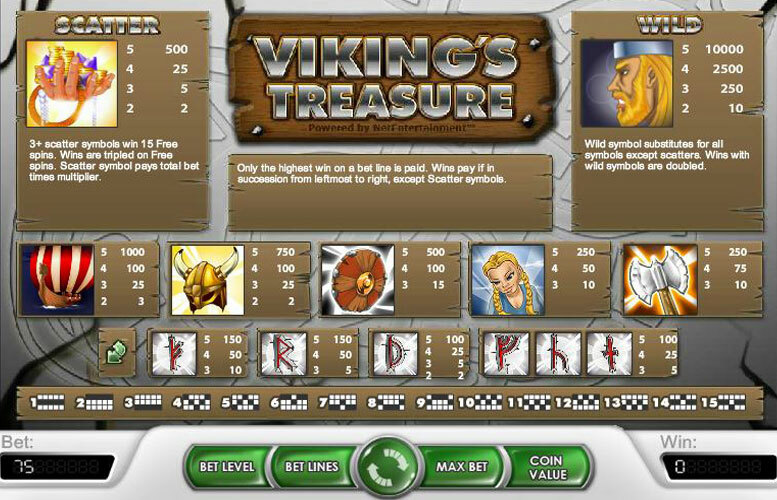 Vikings Treasure offers multiple ways to win big; you can bag the top jackpot of 150,000 coins by spinning in 5 of the Viking symbols or spin in the scatter symbol and get a 500x bet multiplier and trigger up to 15 free spins where all winnings are tripled! This Viking themed game features the people themselves instead of their deities. The game has 15 paylines for players to bet on and has a max payout of 150,000 coins. Enjoy the looting and plundering of rich treasures while listening to the sounds of a creaking ship at sea. The graphics are brightly colored, but they really aren’t anything special or unique. The game has a wild and a scatter which will award the free spins bonus. The game is basic but has low betting options with decent rewards to build up treasure at a decent rate. The creaking ship sounds in the background are cool, and are definitely worth a listen while racking up wins. Only 15 free spins are awarded at a time which in our opinion could be a little more generous however the scatter does pay out the total bet times the multiplier with top one being x500. To win the top jackpot is 150,000 coins and to win it players will need to be betting on their paylines the full five times that they are allowed to (bet level 5). Since players are allowed to pick their paylines, this could technically happen with only one payline, but 15 paylines increases the chances of it happening. 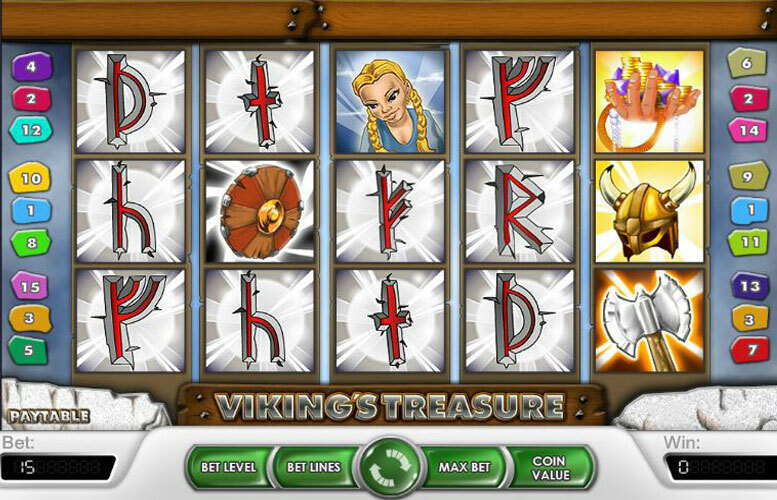 For the 150,000 coin payout players will need to spin five of the wild Viking man symbols on an active payline and do this during free spins where wins are tripled. Scatter: This is a handful of treasure, literally, and spinning three of more of these anywhere on the reels will award the player with a multiplier to the total bet along with 15 free spins that will triple wins. Players can earn the scatter award for 2 or more, with two paying double the total bet, three are 5 times the total bet, four are 25 times the total bet and five are a 500x multiplier on the total bet. The free spins can be re-triggered if three or more appear during the free spins. Wild: This shows a Viking man and it will double any of the combinations that it completes or subs in to complete. Five of these filling a payline will award 10,000 coins, four pays 2,500 coins and three pays 250 coins and two wilds will pay 10 coins. Ship: The Viking ship will pay 3 coins, 25 coins, 100 coins, or 1,000 coins for combinations of two, three, four, or five on a payline, respectively. Helmet: The helmet pays the same values for three and four combinations as the ship. Two only award 2 coins and five symbols pay 750 coins in contrast to 1,000 for five ships. Shield: This pays 15 coins for combinations of three, but four in a row still pays 100 coins, just like the icons before it. Five shields spanning the reels on one of the 15 paylines will pay 500 coins. Woman: This blond haired woman will pay 250 coins for five, 50 coins for four, and 10 coins for three being on a payline. Axe: The final picture symbols pays the same as the woman, except that four symbols actually pays 75 coins instead of only 50 coins. The letters are Norse writing symbols. Whether they are the actually symbols for the corresponding letter or number is unknown. A or K: These two will pay the same four combinations of four or five, which would be 50 coins and 150 coins, respectively. The A will pay 10 coins for three and the K pays 5 coins for three matching. Q, J, 10, or 9: All of the remaining letters share equal payouts for three, four and five matching on a payline: 5 coins, 25 coins, and 100 coins, respectively. The Q, however, will also pay out 2 coins for two matching starting one of the 15 paylines. Players can select to play with only one payline or choose to play the full 15 lines that the game features. There are a maximum of 5 bet levels, which means the total credit bet for the game will be between 1 and 75 credits. The coin values are between 0.02 and 0.50 coins. This makes the total bet for the game anywhere between 0.02 all the way up to 37.50 for the maximum total bet. Players need to bet the max amount in order to win the top payouts discussed in the above section. This game has a rating of 4 / 5 with 291 total reviews by the users.